Wholesale Coroplast Signs are affordable advertising tools suitable for outdoor spaces. These corrugated plastic signs are a budget-friendly option for seasonal sales promotions. Finishing： Cut to size. H Stands and grommets are optional. A custom Coroplast Sign can maximize your client’s brand exposure. 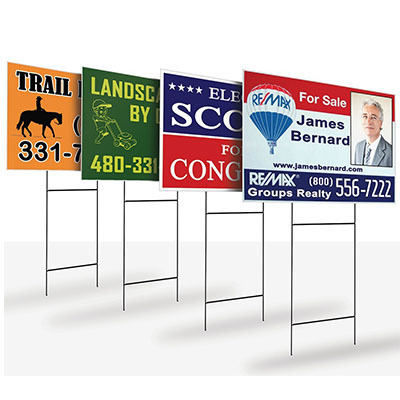 When placed on lawns, wholesale Coroplast Signs attract the attention of drivers and passersby. Lightweight and easy to set up, custom Lawn Signs are especially suitable for local businesses advertising in nearby neighbourhoods. A custom Lawn Sign must grab attention even from afar. A bold headline should be the visual focus of your design. Other important details, such as contact information, can be written in a smaller font underneath the headline. At SinaLite, you can choose from a variety of sizes and styles for your client’s Coroplast Sign printing needs.